Bitburger | Beer Apprentice - Craft Beer News, Reviews, Interviews and Info. Hello guys. Time for another craft beer review. 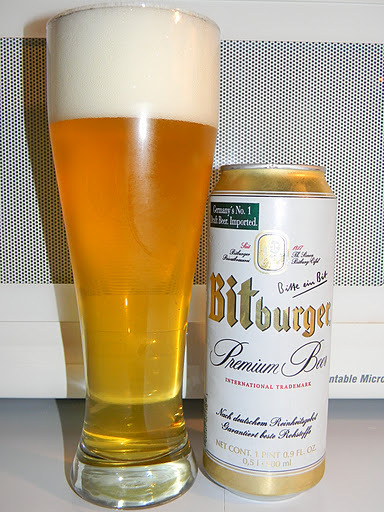 For today’s drinking pleasure I’m going to be trying the Bitburger Premium Beer brewed by the Bitburger Brauerei located in Bitburg/Eifel, Germany.I’ve yet to have a beer from these guys, so let’s just get to the website, bitburger.com, and find out about this brew. Bitburger guarantees premium quality and enjoyment. Drawing on almost 200 years of expertise, the full-bodied, light Bitburger Premium Beer is of course brewed according to the German Purity Law. Its popular, dry-finished, hoppy taste has secured Bitburger Premium Beer its position as Germany’s no.1 draught beer. This version came in a 16.9 oz. can and has an ABV of 4.8%. The beer poured a very clear yellow/gold color with a wonderfully sized, bright white head. It was rocky, soft, fluffy and soapy in texture. The retention time was pretty good and the lacing wasn’t too bad either. It looked very nice standing in the tall glass in which it was served. The aroma aroused notes of corn husk and corn “silage” intermingled with bits of hay and grain. Very clean bready malts and unsalted crackers gave a bit of “meat” to the nose. It smelled fresh too. No skunkiness or putrid odors. I thought it to be well balanced and harmonized. The bouquet wasn’t real potent, however it had a lot of the proper attributes that accompany a Pilsner styled beer. The taste was very crisp, clean and fresh. It revealed a suitable grain bill with a light grassy hop note. The bitterness was remote and minute, but I still received a slight tickle on the sides of the tongue. A light lemon citrus and a corn redolence added a subtle sweetness to the taste profile. Dried wafers and baked breads helped to smooth and round the flavor profile. Again, nicely balanced and even, but not particularly weighty. The mouthfeel was medium to light. Very smooth, crisp, clean and snappy. It maintained a suitable dryness along with a very refreshing and thirst quenching appeal. Most of the flavor vanished from the palate fairly quickly, which was to be expected from this type of beer. You know. I kind of liked this beer. It was super easy to drink and very sessionable. This brew would be ideal during Spring and Summer after a hard days work. It wasn’t too complicated nor complex, although I found that it did have enough character to warrant some discussion. I think it would be worth a try if you happen upon it. When next Summer arrives and I have finished mowing the lawn on a 95 degree day, I may reach for this brew instead of some of the Hefe’s and Wheats that I normally go for. It would be an excellent change of pace in my opinion. So, try the Bitburger Premium Beer and let me know what you thought of it. Thanks for reading and commenting everyone. Remember, you can find me on Twitter (@BeerApprentice) and Google+ (Beer Apprentice) if you would like to talk about craft beer further.